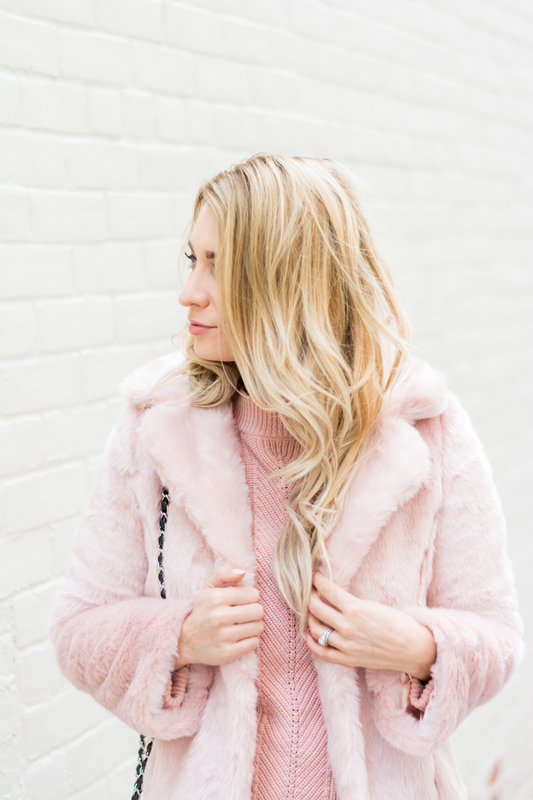 OOTD - Pink Faux Fur | La Petite Noob | A Toronto-Based Fashion and Lifestyle Blog. Do you ever wake up some days and just feel over-the-top? Maybe it's a piece of clothing that contributes to this feeling of excess, but on Sunday I woke up thinking "today is the day that I pull out the pink fur." One all-pink outfit, a pair of over-the-boots and one horrified husband later and I had satisfied by need to be a little extra. This pink marshmallow coat for Chicwish is seriously something else. I love how fun it is to wear, and how it completely inspired this over-the-top pink outfit. The jacket can also be paired with all-black to tone it down a bit. With the weather getting colder and colder, I certainly expect to get a lot of wear from this fuzzy jacket. I have the hardest time with over-the-knee boots. As a petite girl who has very muscular legs, it's hard to find a good fit. These boots from Le Chateau are seriously perfect. The stretchy back makes sure that the boots fit perfectly, and I love that it's just a panel in the front that goes over-the-knee. You are so mob wives right now. I LOVE IT! Definitely feeling like this Saturday I'll be over top, too! Can't wait!